Southwest Florida is not exactly Manhattan, but there are lots of beachfront high rise condos with swimming pools. We frequently get calls from owners in the building seeking information on solar pool heating for their condo swimming pool. The client is usually a board member or a concerned unit owner trying to reign in the cost of pool heating with electricity or gas. Sadly, the answer is almost always the same – it’s not a suitable application for solar pool heating. We turn away more than 95% of people seeking solar pool heating for a high rise. Pumping water up multiple stories requires a booster pump that consumes lots of energy. You need a large pump to keep solar panels pressurized, and/or create a restriction in the returning (falling) water to prevent problems. But that restriction just increases pressure and costs more to pump. Most high rise condos have flat roofs. We do not recommend installing solar pool panels on flat roofs for waterproofing reasons, especially high up above the ground where winds become an issue. Commercial pools require a certain flow rate, and plumbing solar panels in series with the filtration can disrupt that flow. Installing separate feed and return plumbing can be expensive and difficult. There is often no plausible route to run plumbing up the side of the building to the roof. Roof-mounted equipment like air conditioners often cause obstructions that prevent adequate coverage to get effective heating. Solar pool heaters are sized based largely on the size of the pool. Since condo pools are often relatively large, lots of solar panels are required. Often there is simply not enough room. Detecting leaks and performance issues on a system multiple stories up, out of view, and inaccessible from external ladders creates a serviceability issue. Last but not least, getting enough condo owners on board to get a solar pool heating system approved is a challenging proposition. So the high rise roof is usually not an option. What about ground mounts, trellis mounts, carport mounts, or other lower roofs? Unfortunately, most of these structures are either not structurally suitable for mounting solar, have shading issues, are not large enough, require heat sapping trenching, or result in a cost-prohibitive installation. 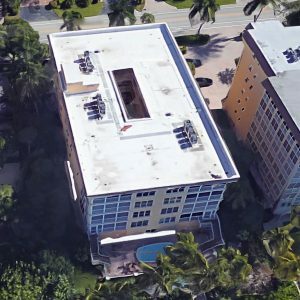 There is another reason solar pool heating is not ideal for high rise condos: Most associations require a given temperature from the time the pool opens to the time the pool closes each day. Since solar heating only works during the daylight hours, it takes a while for pools to come up to temperature. As a result, auxiliary heaters are employed, relegating solar to just maintaining temperature in the afternoon. We hate to say it, but solar pool heating is probably not right for your high rise. Some low rise condos suffer from the same issues but are occasionally able to be overcome. If you live in a condo, do not hesitate to contact us, but be prepared for what may be a disappointing answer. Your condo might consider solar electricity. Solar electricity might be able to offset all or part of your electric heating costs. Some of the same issues apply, but it is much more viable. Equipment for mounting on flat roofs is much more advanced for solar electric panels. Since there is no pumping we only need to get electricity back to your house meter. Although the investment for a solar electricity system is higher, it also provides longer returns and is extremely reliable. Just be prepared to convince condo members who may not have long term plans for residency. While solar for high rise condos might not be the best solution, don’t hesitate to contact us for information. Yours may be one of the rare cases where we have something to offer. If not, we will provide you with an honest assessment.